2.99*USD now until 5 pm ,PDT then 3.99 USD instead of 12,49 USD, 5 stars on amazon and Udemy. Content deal ends soon 4.99 USD raise to 12.49 Euro,Learning more skills in autism, for dads. DADS HURRY .LAST CHANCE discount 4.99 USD soon 12.49 Euro on Amazon!!!!!!!!!!!! If you have a child in autism and don't know what to do.Then this course is for you. A dad telling his mistakes and what he didn't understand to help his adult son with autism when he was a child. You don't want to miss this information!! Do you? Price goes up from 4.99 USD to 12,49 Euro in 5 hours.Learning more skills for dads.Have a better life. 5 stars on Amazon and Udemy. For dads to licence in autism having a child with this diagnose. Uou don't have to license but please take in this information!!!!! Content deal Learning more skills in autism.HAve abetter life (for professionals. Pia Lebsund har lagt till ett nytt foto — på En hyllning till Leons blanks klezmerdans av Edith med vänner. 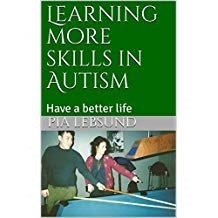 Pia Lebsund In less then 27 minutes Learning more skills in autism.Have a better life had raise up from 0,99 USD to 1.99 USD on Amazon. 4,6 stars reviews on Amazon and 5 stars review on Udemy worth 109 USD about 1500 kr. For professionals to certify in my method Module 1,2,3.Learning more skills in autism. Sensory stimulations, movements and Social skills.If you are doing the exercises and send them to be, you can also license in this step 1. As being around for more then 30 years I met alot of professional in Schools all over Stockholm County and they needed a lot of help, creativity and new input. As a dancer I also have dance in the movements. I am also trained for children and youngsters from Lärarhögskolan after my special pedagogic studies and research. I have other movements that I couched in free ti activities in Stockholm County in the late 90th.I am warning you as a teacher if you are not very rhytmic this can be challenging.But we start with walking properly.